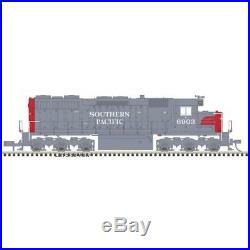 Atlas 40003736 - DCC Sound SD-35 Southern Pacific 6908 - N Scale. Between 1964 and 1966, EMD built a total of 360 six-axle 2,500hp SD35 locomotives. An additional 35 steam generator-equipped SDP35 locomotives were also built during this period. These were all part of EMDs 35-Series which also featured the four-axle, 2,250hp GP35 locomotive. All locomotives included the standard EMD 567-series prime mover. A stock model weighed 360,000 pounds, but many roads chose to add weight to increase the locomotives tractive effort. From the mid-1960s through the 1980s, the SD-35 could be found in road service on both large and mid-sized roads across the US. Today the number of active units has dwindled to a select few, including those operated by regional railroad Montana Rail Link. Features: Directional lighting Walkway safety tread Blackened metal wheels Scale speed&###x2122; motor Factory-equipped with AccuMate® knuckle couplers Painted handrails Golden-white LEDs Atlas Master® Gold models feature ESU Loksound decoders DCC Operation Features (GOLD LOCOMOTIVES ONLY): Supports all DCC-programming modes DCC includes RailCom and RailComPlus, with 14, 28 or 128 speed steps and with 2-digit and 4-digit addressing. Flexible mapping of function keys F0 to F28. A total of 6 DCC function outputs are available, and all can be function mapped (disable, brightness, light effects) individually Follows all NMRA DCC standards and recommended practices. ESU LokSound Features (GOLD LOCOMOTIVES ONLY): Over 20 sound effects are available, including engine start-up and shutdown, prime mover sounds through all eight notches, bell, air horn, air compressor, dynamic brakes and more. There are up to 16 user-selectable horns, 2 user-selectable bells, and 2 user-selectable synchronized brake squeals. Manual and Automatic Notching modes with the ability to change modes on the fly are provided for true realism. If you meet your obligation why should you have to wait. We do appreciate all of our customers but occasionally a problem does arise. Canada, United Kingdom, Germany, Japan, and Australia. We will be listing new items every week so come back and see us soon. The item "Atlas 40003736 DCC Sound SD-35 Southern Pacific 6908 N Scale" is in sale since Saturday, August 11, 2018. This item is in the category "Toys & Hobbies\Model Railroads & Trains\N Scale\Locomotives". The seller is "midwestmodelrr1" and is located in Kansas City, Missouri. This item can be shipped to United States, Canada, United Kingdom, Germany, Japan, France, Australia.